The PVM-2541A Super Top Emission OLED display panel features full HD resolution (1920 x 1080) and RBG 10-bit driver to create life-like and smoother-than-ever gradation from dark to bright portions of a scene. The colour shift depending on viewing angle has reduced to less than half (less than 50%) compared to a conventional OLED panel. Viewing angle is no longer an issue in practical usage, where three people in front of the monitor can evaluate at the same time across a 45 degrees angle. TRIMASTER EL technology is a design architecture that enables the highest level of colour accuracy, precision imaging, and picture-quality consistency. Because the EL (Electro-Luminescence) layer inherently responds to any electrical current input, it emits light immediately. This allows excellent quick response characteristics in fast-motion images. This efficient, blur-free, fast response time is beneficial across a variety of applications and scenes, such as sports broadcasting, the monitoring of camera panning and text scrolling. Thanks to Sony OLED display technology, all details in the black can be easily seen. The PVM-2541A provides the colour gamut specifications of the main broadcast standards: ITU-R BT.709, EBU and SMPTE-C.
Sony’s Super Top Emission™ technology uses micro-cavity and colour filters. The micro-cavity structure uses an optical resonance effect and the colour filters enhance the colour purity of each RGB colour. The technology also reduces ambient light reflection, so deep colour reproduction can be achieved without degradation, even in bright environments. 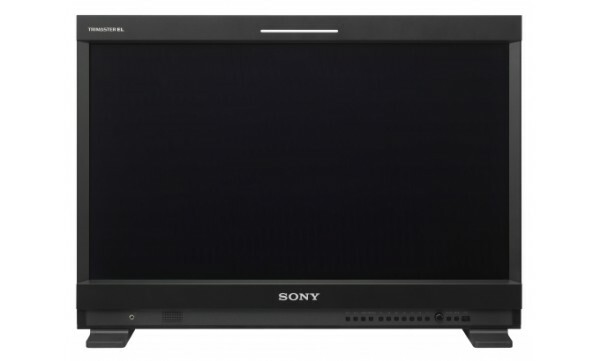 The PVM-2541A monitor incorporates an OLED processor to bring out the full performance of the Sony OLED panels. This OLED processor offers superb uniformity across the whole screen. At the factory, the OLED panel uniformity is precisely measured and corrected using a sophisticated RGB LUT (Look-Up Table) adjustment system. This mode interpolates images between fields. This is used for optimum picture quality reproduction, for example, to reduce the jagged effect on moving pictures. This mode interpolates images within the field, and delivers naturally reproduced images and lower video delay. This mode is available for 1920 x 1080 SDI signal input. This mode combines lines alternately in odd and even fields, regardless of picture movements. This is used for PsF (Progressive Segmented Frame) processing and still image monitoring. This mode interpolates by repeating each line. This is used for editing and monitoring fast-moving images and checking line flicker. The minimum processing time is less than one field (0.5 frames). The PVM-2541A incorporates a lightweight, compact metal body. 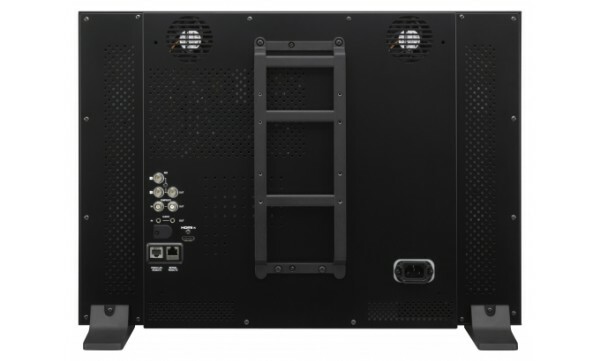 It supports VESA mounting of 100 mm pitch and an EIA 19-inch standard rack mount. Although the monitor has its own display stand, an optional stand SU-561 is available for height and tilt picture adjustment. These features make the monitor ideal for use in a variety of applications, such as desktop editing, office viewing, studio monitor walls, or installing in an OB van. A rotary-type switch and seven function-assignable buttons allow users speedy and intuitive operation. Operation buttons with LED indicators enable error-free operation, even in dark environments. The LED lights can be switched on and off, as required. The combination of the vector scope and waveform monitor functions allows simple measurement without additional measurement equipment.The input signal’s waveform with a 2-channel audio level meter can be displayed on screen. Scaling data is available for quick measurement. The waveform can display field or line status. A zoom function is available between 0 and 20 IRE so that black level can be adjusted more precisely. The vector scope has scaling data for 75% and 100%. Zoom function is also available for the low levels. The PVM-2541A is equipped with built-in standard input interfaces: 2 x 3G/HD/SD-SDI; 1 x HDMI input; 1 x analogue composite. When an SDI interface is connected, the embedded audio channels up to 16 can be displayed on screen with an 8-channel audio level meter. A time code superimposed on SDI signals can be displayed on screen. Users can select either LTC or VITC. X-Rite: i1 (Eye-One) Pro and i1Pro2. The PVM-2541A has an external remote control capability for input/output signal selection and adjustment of various items via Ethernet (10BASE-T/100BASETX) connection. Up to 32 monitors and up to four control units can be connected via Ethernet connection and controlled remotely on the network. The PVM-2541A also supports some (though not all) of the functions of the BKM-16R – an optional remote control unit for BVM-E/BVM-L/PVM-L Series monitors – such as power on/off switch and Input Select function. C.C.I.A.A. 784859 - Capitale Sociale € 50.901,00 i.v.